After we moved from New York City to Mt. Tremper 3 years ago, it didn’t take long for me to catch the bug; not a tick or Lyme disease, but the eco-friendly bug. I had always been environmentally conscious—recycling, buying Energy Star appliances and so forth, but living in nature made me want to take it to a new level. Hungry for information, and slightly obsessed, I gobbled up tips on living green from magazines, researched alternative energy online and talked to contractors as well as other homeowners. The more I learned, the more I noticed the flaws in our charming, seemingly move-in ready 3-bedroom 1950s ranch house. In the summer when my husband and I were house-hunting, we felt like we had found an enchanted retreat nestled against a mountain. Now in the dead of winter, it was more like a money-burning, energy-leaking outdated old house. Dreams of peaceful living were clouded with rising oil prices and an increased awareness of our own negative impact on the environment. The major offenders were our heating and domestic hot water system, consisting of an oil furnace and baseboard hot water heat, and our home’s “envelope”: the windows, doors and insulation (or lack thereof). Most of the windows, like the doors, were at least 50 years old and barely protected us from the elements. The heat came in during the summer and out in the winter. And the heating system itself was a monster. An enormous hunter green oil tank sat in the basement on four little legs like an oversized piggy bank, with an equally large furnace that startled us every time it fired up and a stand-alone water heater. Together they dominated the basement and ate away at our wallets as well as our peace of mind. Summers were incredibly humid and winters were cold and frighteningly expensive. In the winter, the temperature dropped considerably in our bedrooms, the radiator in the kitchen didn’t work at all, and the hardwood floors turned seemingly into slabs of ice. Guests had to be warned to bring thick socks, and we cringed every time we saw the yellow oil bill left hanging on our front door by our supplier. It was time for some major changes and an opportunity to make the house more environmentally-friendly. Late spring/early summer seemed an ideal time to start our project. Since it doesn’t matter what kind of heat you have if it all goes out the windows … and the doors … and the attic, the first step was to “seal the envelope.” We began by replacing the windows, most of which were double-hung and paper thin, as well as the skylights, French patio doors and the garage door. We chose low-e, argon-filled Energy Star® windows and doors from Jeldwen. The low emittance (low-e) coating reflects heat back to its source and blocks UV rays which can fade furniture and curtains. Argon, a nontoxic gas, adds another layer of insulation to the glass. The difference was immediate and noticeable, especially in the living room where a large picture window now kept the room cool in the summer and comfortable enough to lounge under even on the coldest days. The house looked instantly updated. Our retreat was coming to life. With the windows and doors replaced, it was time to put all my research to work on finding a more efficient and eco-friendly system for our heat and domestic hot water needs. Ideally, we wanted to eliminate our dependence on fossil fuels altogether, but cost was a big factor, as was the availability of local contractors experienced in alternative energy systems. The first stop was NYSERDA’s Web site and the Energy Smart Program at www.getenergysmart.org to determine which systems and contractors qualified and what incentives were available to offset our costs. Then, we interviewed three companies, including Advanced Comfort Systems, a Kingston-based heating and cooling company. Through research and interviews, it became evident that radiant hydronic floor heating was the best method to deliver heat for our house. “Radiant is a great alternative to baseboards, not only because it is more efficient but because it produces a more natural feeling heat,” said Rich Cavanagh of Advanced Comfort Systems and a certified designer and installer with RPA (Radiant Panel Association). In fact, radiant heat is produced with a significantly lower water temperature than baseboard heat, which means it requires fewer natural resources. It also feels warmer throughout the whole house, like a cocoon, so you naturally set the thermostat a little lower. Both factors result in lower heating costs. Next, we had to determine what source we would use to generate heat. With radiant hydronic systems, there were many compatible sources to choose from: geothermal energy (pumping the earth’s natural hot water up from the ground), solar thermal (heat from the sun), fossil fuels such as oil and propane, and even wood-burning stoves. Sadly, the costs of geothermal energy (our top choice) exceeded our budget, and we weren’t quite convinced that our energy usage would merit the high initial price tag. Solar thermal, another clean energy source, wasn’t capable of providing all of our heating and hot water needs given the challenges of the northeastern climate. However, with various combinations of systems now available at all price levels, we were able to find one that would significantly reduce our heating costs, as well as our impact on the environment, and that could be combined with alternative energy sources in the future. Together with our selected installer, Cavanagh of Advanced Comfort Systems, we determined that the interim solution was to change from oil to propane with a new, ultra-efficient boiler coupled with radiant hydronic floor heat. Propane, a by-product of oil refinement, is not typically as expensive as oil and less of it is required to heat the same amount as oil, further reducing your costs. The cost of installation and materials for a radiant floor heating system, averaging $10 to $15 per square foot ($15 includes a high-efficiency propane boiler), was within our budget. 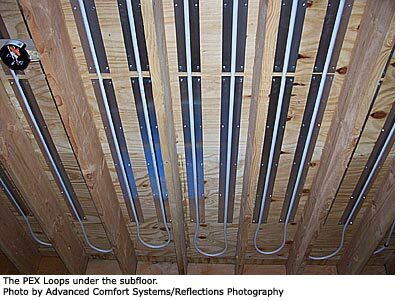 After removing our old baseboard units, Cavanagh and his team stapled loops of PEX tubing underneath the subfloor, which was already exposed in the basement, to circulate the heated water along with extruded aluminum transfer plates. Then our general contractor, Tom Mayone, filled the joists with the appropriate fiberglass insulation (R-18 rating) for our unheated basement, the lack of which partly accounted for our cold floors. There are several key components which Cavanagh combined to create a more efficient system, and thereby more eco-friendly, which could be adjusted specifically to our needs. 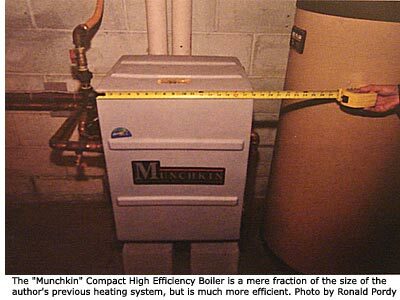 Our standard, refrigerator-sized boiler was replaced with a modulating, condensing boiler appropriately called “Munchkin 80m” for its compact size. Unlike our oversized, single-fire boiler which used a whopping 120,000 BTUs every time it fired up (hence the house-rattling bursts), the Munchkin modulates between 27,000 and 80,000 BTUs to match the energy requirements of the house, rarely using its full capacity. It operates quietly at 95.1% efficiency. The off-gasses are contained within the boiler and reused as part of the heat source rather than “going up in smoke” or at least up the flue as with an oil furnace. Its low emissions are directly vented out through an exterior wall. Cavanagh also installed Tekmar Energy Management Controls which allow the water temperature to adjust itself. Weather response controls send outdoor temperature readings to the inside thermostats, which in turn provide indoor temperature feedback to the boiler so it will adjust the BTUs to match the heating load of the house. The radiant fluctuates to maintain an even temperature throughout the house. The Tekmar controls also enable you to set an occupied and unoccupied temperature with the flip of a switch or remotely by phone. Weekenders particularly can benefit from its remote control feature and built-in freeze alarm which calls you when the temperature drops to dangerous levels. The system’s panel which Cavanagh prefabricated at his shop and custom tailored for each zone is a work of art hanging on our basement wall. And, now that the monstrous green oil tank and the furnace have been replaced by a smaller, propane tank safely buried in our yard, we’re reclaiming our basement which is no longer a concrete icebox. This past winter was cozy, comfortable and quiet. We even walked barefoot on our hardwood floors. No cool spots, scary bills or excessive worrying about our carbon footprint. More than ever, we’re looking forward to the changing seasons and eventually taking the leap off the grid. Advanced Comfort Systems is located at 289 Clifton Avenue in Kingston. For more information, call them at 845 943 9564 or e-mail radmix@msn.com.